In the age of smart devices, students are digitally well-connected, but a Tweet or a Snap lacks the depth and connection that a face-to-face conversation delivers. In the school library, there is a unique opportunity to observe many student behaviors throughout the day. Some of these behaviors include failure to greet others, to make eye contact, to wait for others to finish speaking, to ask follow-up questions, and, most importantly, to listen and respond to an opposing point of view. Students have every communication tool at their disposal, but it is a great disservice to them if active listening and thoughtful questioning skills are not fostered. 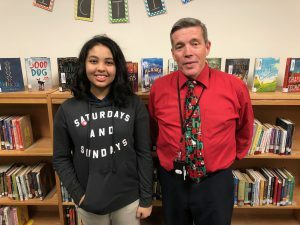 I thought about what could I do in the school library to foster more meaningful conversations among my students, and that is where StoryCorps came in. StoryCorps is a non-profit organization that provides a free platform for people all over the world to record interviews with each other. There are different ways to record with StoryCorps, but all interviews are curated and archived at the Library of Congress. Since the launch of the StoryCorps app and StoryCorps in the Classroom initiative, it has never been easier for schools to participate in StoryCorps. Recording with the StoryCorps app is completely free if you have a smartphone or tablet with access to the app. However, to create palpable excitement for my StoryCorps project, I envisioned creating a recording studio within the professional library room. I wrote a grant for the professional recording equipment, which included a MacBook Pro, two Blue Yeti microphones, two Knox pop filters, three Tascam headphones, Belkin headphone splitter, a neon “Recording in Progress” sign, and a collection of books about StoryCorps from its founder, Dave Isay. My students have used the StoryCorps app to do practice interviews with each other, but the recording equipment would allow my students to learn about editing. Prior to recording interviews, I sent home permission slips for students to be allowed to be recorded and share personal information. 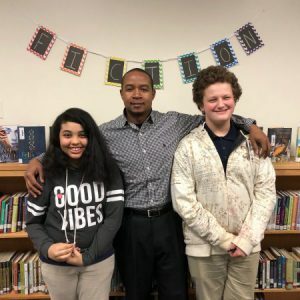 Students have to be at least thirteen years old to have a StoryCorps account, and my students share their names, ages, location, and a photo for each interview. I partnered with an eighth-grade language arts teacher for this project who sends a small group of students to work on this project in the library. StoryCorps in the Classroom has lesson plans, instructional videos, a question bank, and helpful tips on their website to get started. My students have learned how to write good interview questions, how to conduct themselves during an interview, and how to use the recording equipment. For their first interviews, my students wanted to interview the principal and the assistant principal. They will continue to interview teachers and classmates before we reach out to the community for interview requests. One of my favorite things about StoryCorps is that the interviews are all student-led. I have worked with students to compose good questions and do practice interviews with them, but I have a silent role during the interviews. I push record and stop and encourage the students to keep going if they stumble on their words. Part of the project is for them to learn how to edit a sound recording. One thing my students learned early on is that no interview will be the same. Some people are natural storytellers and will engage easily in conversation, whereas others will give short responses to questions. I try to keep our interviews no longer than twenty minutes, depending on the interviewee. Over time, students will learn to be better listeners and to think on their feet in order to draw out responses from their interviewees. After every interview, a picture is taken with the participants. Then the interview and photo are uploaded to the StoryCorps Archives. I prefer to upload all interviews on my account so that I can monitor content. There are different privacy settings if disclosure of student information is a concern. My students were challenged early on by learning how to use Audacity, a free sound editing software, so that they could seamlessly include an extended response to one of the questions in their interview. After each interview, the students also complete a reflection sheet about how they think the interview went so that they can see their growth as they accumulate interviews. In addition to sending an email request for an interview, students send a follow-up thank you email along with the link for the interviewee to hear their interview. We plan to create our own website to archive our work with StoryCorps and eventually learn how to animate our interviews like StoryCorps does. StoryCorps celebrates diversity and supports my mission to teach my students that everyone has a story to be told, and everyone deserves to be heard.